A new IUPUI study funded by the U.S. Department of Agriculture answers a long-debated agricultural question: whether no-tillage alone is sufficient to prevent water pollution from nitrate. The answer is no. Researchers in the Department of Earth Sciences in the School of Science at IUPUI conducted a meta-analysis to compare runoff and leaching of nitrate from no-till and conventional tillage agricultural fields. Surface runoff and leaching are two major transportation pathways for nitrate to reach and pollute water. Due to its mobility and water solubility, nitrate has long been recognized as a widespread water pollutant. 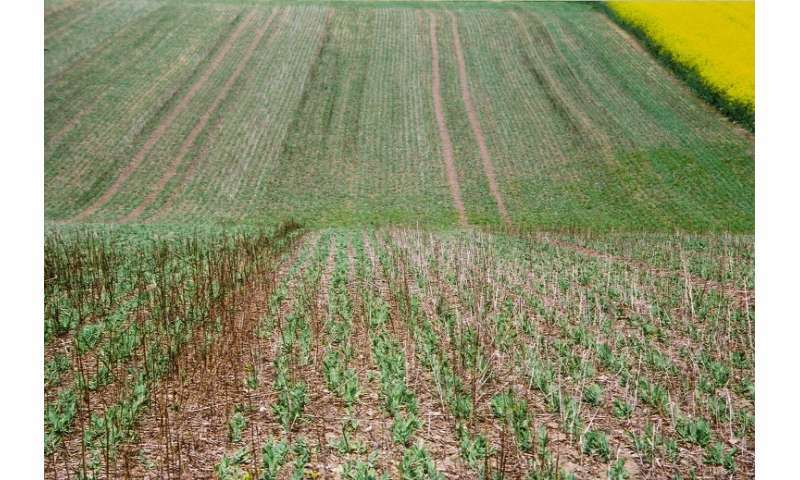 "What we found is that no-till is not sufficient to improve water quality," said Lixin Wang, an assistant professor and corresponding author of the paper. "In fact, we found that no-till increased nitrogen leaching." The study suggests that no-till needs to be complemented with other techniques, such as cover cropping and intercropping or rotation with perennial crops, to improve nitrate retention and water-quality benefits. After studying concentration of nitrate—nitrate amount per water volume unit—and nitrate load, or total amount of nitrate, researchers found surface runoff from no-till fields to contain a similar nitrate load to surface runoff from conventional tillage fields. In contrast, nitrate load via leaching was greater with no-till fields than with conventional tillage fields. No-till leaves crop residue on the soil surface and limits soil disturbance except for small slits to add fertilizer. An estimated 20 percent of all croplands in the U.S. are under no-till management. It reduces soil erosion by avoiding tilling year after year, which leads to soil getting washed away into lakes and rivers. Because reducing soil loss reduces nutrient loss, it was assumed that no-till would reduce water pollution, Wang said. "Overall, we found the adoption of no-till resulted in increased nitrate loss via leaching due to the frequent occurrence of macropores, such as those created by dead roots and earthworm burrows, in soils that have been under long-range no-tillage management," Wang said. Researchers examined how nitrate loss through surface runoff and leaching were impacted by other factors, including aridity, rainfall variability, soil texture, crop species, duration of tillage and fertilizer type. The research findings are presented in a paper, "Impacts of no-tillage management on nitrate loss from corn, soybean and wheat cultivation: A meta analysis," that was published Sept. 21 in the journal Scientific Reports. Terrific, let's poison the environment while we grow food. That's a strategy for sustainability (not). In fact, not one human endeavor is sustainable, ecologically speaking. What a surprise. Lets ensure that the criminal corn ethanol subsidy remains in place so 40% of all corn will go to bio-fuel. Lets not forger the phosphates and uranium which is also dumped into the environment by this policy. Guess the farm lobby and green lobby are united in ecological destruction. Hahaha, the oldest method, and the one the whiners decry as "gummint interference" the most often, works the best: crop rotation.